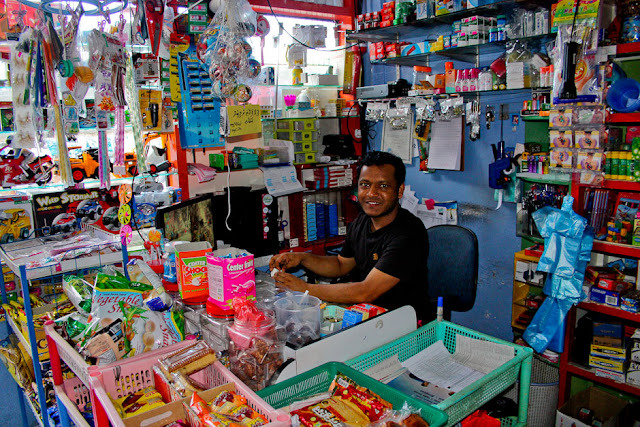 A shopkeeper at local tuckshop smiles at the camera. The law says that only a Maldivian local can man a cash register, but as we can see here, the law is not always followed. monitored or enforced. Most of the shops, and cafés I go to have expatriates serving us, with no Maldivian locals in sight. This is not without reason either. Most of the business try hard to get local Maldivians to come work with them, but they just don't find qualified local staff, and even if they manage to find a few, they just dont stick around for long. I hope this changes soon. Expatriates won't do our work for us forever, nor can we afford to import foreign labor without economic and social consequences.